How Does a Black Hole Eat Its Breakfast? A large black hole located at the centre of an active galaxy. 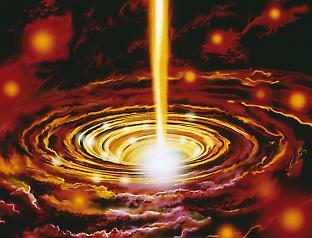 An accretion disk forms as matter falls inwards from the galaxy. The matter forms a spiral disc that is compressed and heated so that it begins emitting photons. The accretion disk becomes so hot that its radiation physically pushes matter away from the black hole, and accelerates gas into the jets that emerge from its poles. The bending of space–time by mass allows astronomers to peer deep into the universe, and they have begun to use this to probe one of the most enigmatic phenomena in the universe: the explosions of light surrounding black holes known as quasars. David Floyd is an Australian Astronomical Observatory “Magellan Fellow” and researcher at the University of Melbourne.